Hey, anyone who still sometimes checks TedQuarters! I wrote a thing about the breaded steak sandwich from Ricobene’s, the best-rated sandwich in this site’s history. People seem to be enjoying it. The next paragraph of this post contains a bold and speculative claim about a sandwich, but I need you to understand that it is not an unresearched one. I worked in a deli, making sandwiches, for three years. At my last job, I regularly wrote sandwich reviews. I have traveled to 42 states and 20 countries and eaten sandwiches in most of them. I know sandwiches, I promise. And the breaded steak sandwich from Ricobene’s in Chicago is the best sandwich in the world. Mark it down. When ordered with mozzarella cheese and hot giardiniera — those are important — the sandwich presents a combination of flavors and textures that bests every single one of the thousands of other sandwiches I’ve sampled in my 34 years. Just because I never update TedQuarters doesn’t mean it’s not Taco Bell Tuesday. Conan O’Brien toured Taco Bell headquarters in Irvine, Calif. for a segment on his eponymous TBS show that aired last week. It was all very funny, and the beloved late-night host even got to try something called a Quesalupa — an experimental product that presumably includes some combination of meat, cheese, beans, tortilla, sour cream and tomatoes. Apparently men of Conan O’Brien’s stature can just waltz on in to the Taco Bell test kitchen, a veritable El Dorado for all us shmos out here waiting on our invites. And to be fair, he deserves it: O’Brien, certainly, has loads of talent and worked hard to get where he is, so we shouldn’t begrudge him the incredible opportunity we ourselves have been so long denied. It’s just a bit frustrating, is all. How should Derek Jeter leave the field in his last game at Yankee Stadium? Lots of Photoshopping for the people. On Thursday night, legendary Yankees shortstop Derek Jeter will play in his final game at Yankee Stadium. And though the club already celebrated Jeter’s exceptional career with Derek Jeter Day on Sept. 7, the future Hall of Famer will certainly acknowledge the adoring Bronx crowd in some way one last time before he heads to Boston on Friday for the last series of his career. Reblogging this here because it’s a) about baseball, b) something I spent a long time on and c) a topic touched upon here back in 2010. This is hardly a secret: Offensive numbers are way down around Major League Baseball. The league-wide OPS sits at .703, the lowest mark in over two decades. Pitchers throw harder. Strikeout rates have skyrocketed. Aggressive defensive shifts turn more hard-hit balls into outs. In short, it’s just not an easy time to be scoring runs in the big leagues. But there’s a potential advantage already available to hitters, and precious few Major Leaguers have even given it a try. Multiple companies produce bats with ergonomic knobs that have been shown to improve the speed, power, and control of hitters’ swings and reduce the hand injuries and discomfort common with conventional bats. Hello TedQuarters. I am procrastinating. I have actual, paid work I should be doing, but it’s a beautiful Saturday on the Upper East Side. And while I caffeinate, I figured I’d stop by my old haunt here to pay tribute to one of the people who indirectly made it possible. More on that soon. As for that actual, paid work: It’s still happening, and you should check it out. The transition from writing for an extremely niche audience — Mets fans who want to know what I had for lunch — to the much broader one understandably preferred by USA Today took more of an adjustment than I expected, but I think I’ve finally found a way to marry the style that drove this site with the one necessary to appeal to more casual baseball fans. I’ve been pretty happy with my output lately, which is rare for me, and I suspect you’ll enjoy it too. I pray daily that clips from the show — archived somewhere on VHS — never surface on the Internet, since it was generally more juvenile than good, and I try to maintain some semblance of professionalism now that I have a job and a wife and rent to pay and everything. I had a lot of fun making it and don’t regret it at all. But many of the things college kids do are best contained to college audiences. I’m sure you understand. “Dude, did you see the Colbert Report?” I asked, dejectedly. That was the only time I ever lamented the program’s existence, but it did frustrate me at first. My dream, at that point, was to someday create a professional version of the show we had in college, to convince someone to pay me to make jokes about sports. And Colbert’s character, from Day 1, was a better-developed, funnier, more polished version of the obnoxious caricature of myself that I had used to make jokes about sports. I knew immediately that Stephen Colbert was doing what I wanted to do better than I could ever do it, even if he was covering a different subject matter. And I realized that if I were to pursue it, I would inevitably look like I was ripping him off — even if it was something I started doing years before his show even existed. It didn’t stop me from making jokes or liking sports, of course, since I made jokes and liked sports long before either became part of my professional ambitions. But it did force me to alter my hopes and expectations for whatever I would do in life. Keep in mind: This was before I had my first job in this career. I was in grad school, and prepping high-school kids for the SATs to help pay for it. I loved the show from the start. 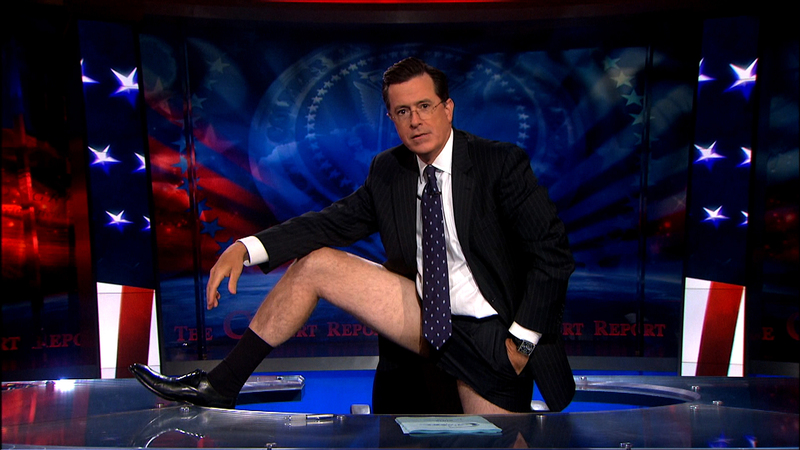 Colbert is, I think, still underrated even after all the accolades. He’s a viciously talented guy, so good at and so dedicated to staying in character that its easy to forget he’s in character at all. He ad-libs in character. He conducts interviews in character. He creates SuperPACs in character. He hosted the White House Correspondents Dinner in character. It’s outrageously impressive, and totally punk rock. About six months after Colbert Report first aired, I stumbled into a job at MLB.com. There, eventually, they let me start writing about the Mets on SNY.tv. In early 2008, I was hired by SNY proper, where they let me continue writing about the Mets, and soon let me write jokes for The Nooner — a well-intentioned but largely underwhelming and under-viewed daily sports-comedy web show. They let me write. That’s kinda important to note. Maybe they even wanted me to write. But they never told me to write, and it was made pretty clear — especially at first — that I was not hired to write. I’m not bitter about it now, nor do I really blame them. Lots of people want to write, and if they wanted a full-time writer at my salary, they easily could have found someone a lot more established. Regardless, I like writing, and I saw writing for The Nooner as an opportunity to make jokes about sports, even if it wouldn’t be me on camera telling the jokes. But despite our best efforts, the show kind of sucked. It’s just too hard for a writing staff of two dudes with limited experience to come up with five minutes’ worth of funny but generally inoffensive jokes about New York sports by 10 a.m. every weekday without chronically repeating themselves. When writing, of course, I try my best to write things I will be proud of. And with The Nooner, I wanted to make jokes I found funny even if I knew they’d never be credited to me, and even if I realized half of them would get cut from the script for being too strange or too edgy or too stupid. Pages upon pages of jokes I wrote that no one but me and the other guy and our boss ever heard — many of which I still find funny — were lost forever when SNY reformatted my old computer. But again, no regrets: All good practice. And I learned something about myself while trying to make those jokes: On mornings I watched the Colbert Report, I liked my output a lot more. It was never really a conscious thing. But I think, as someone who has always wanted to write comedy in some form, hearing good jokes makes me think about why they work and helps me better understand exactly what I think is funny. Maybe everyone does that. I can only speak for me, obviously. So I started watching TiVo’d episodes of The Colbert Report every morning before I left for the office as something of a warmup, a habit that continued when they let me start writing this site. And I guess I recognized — again, not really consciously — that the best jokes are usually the most truthful and honest ones, even if they’re presented as sarcasm or satire. Because that’s the most impressive thing about Colbert, I think: He manages to poke fun at nearly every aspect of our ridiculous political landscape in a deceptively nuanced way without ever seeming like he’s taking himself (or anything) too seriously. It’s a credit to him, his on-air persona, and his writing staff, and something I think often gets overlooked because we’re all too busy laughing to think about it critically. Which is the point, I suppose. Writing here daily, I made honesty and clarity my overarching goals. So it might seem counterintuitive that one of its prevailing influences would be a show so firmly established as satire. But it was. I’ve always liked sports, but I never read much sportswriting before I started doing it myself. Certainly I pick up bits and pieces from other sportswriters, taking note of what I like and what I don’t and doing my best to incorporate the former into my work. But if I’m being honest about the people that most influenced the way I think and the way I write, it’s a pretty short list: My family, my friends, a handful of dead novelists, a couple of songwriters, and Stephen Colbert. Which is all a long-winded way of explaining why the news that Colbert will replace David Letterman on the Late Show nearly moved me to tears: It’s some form of pride for someone I’ve never met but long appreciated, and happiness for the remarkably redeeming reminder that sometimes the all-too-often misguided whims of mass media do reward the stealthy type of honesty, grace, talent and integrity that I strive for — that every so often the cream really does rise to the top. I’m not saying I think I am or ever will be as good at anything as Stephen Colbert is at being Stephen Colbert, only that I feel vindicated by knowing that his ability and his dedication to it were enough to get him tapped for one of the top jobs in his game. And it makes me want to give the real Colbert — Stephen Colbert (person), not Stephen Colbert (character) — a big ol’ hug. I hope in his final performance on the real show, he can break character long enough for a curtain call, so the audience can give the real guy behind the persona the prolonged standing ovation he deserves. I studied art in grad school, which does not exactly prepare a student for a career in sportswriting, or anything. But I loved it, because I loved the way it taught me to think and the way it helped me understand what I love about the art I love. And it’s there, definitely, in The Colbert Report every night. And I think, even more than the jokes, that’s what has made the show so helpful to me in my own creative pursuits for the last six years. Colbert is incredible at what he does, and he makes it look incredibly fun. That should be the goal, I think, for everyone working in any medium, whether it’s sculpture or spreadsheets or woodworking or writing about shirtless photos of Harry Caray. It sounds so simple, but I think it’s all that really matters: Love what you do, and be great at it. I talked to a college kid a few days ago about his lofty career goals, and it got me thinking about myself in college and my own silly 21-year-old dreams. But then I realized, for the first time, that I’m now doing exactly what I always wanted to do: I get paid to write jokes about sports. I’m not trying to brag. It’s incredible. And though I may grumble sometimes about some aspects of my job like everyone grumbles sometimes about aspects of his job, I know I’m incredibly lucky. And I think I owe it, in part, to a TV show that served as a daily reminder of what I want to do and how I want to do it. So thank you, Stephen Colbert. Enjoy being the Alpha Dog. Wu-Tang Clan rapper Inspectah Deck shackled the masses with drastic football analysis on Friday, taking to Twitter to mock the New England Patriots. Deck — also known as the Rebel INS — confirmed that he is a New York Giants fan, as one might have guessed from the way he slams tracks like quarterback sacks from L.T. Also active on Instagram at @INS_tagrams, Deck engaged Twitter followers in football talk while he awaits processing on charges from the system for murdering the rhythm. Hey people who still check TedQuarters! This thing I wrote about Mike Piazza and the Hall of Fame and everything might appeal to you. Also, know that the Grilled Stuffed Nacho is overrated. Noble effort by Taco Bell to mold Taco Bell stuff into a new shape, but there’s no good reason for it to be that shape. Stick with the Beefy Nacho Griller, which is cheaper and features basically the same ingredients but better distributed. XOXOXO, Ted. I worked as a vendor at Shea Stadium in the summer of 2000. I stunk at it. Earning only commission but living comfortably in my parents’ house, I lacked the motivation to haul hot dogs up the endless stairs of the upper deck with the briskness that would make me real money. Mostly, I just wanted a free ticket to watch Mike Piazza hit four times a night. During batting practice that season, women lined up near the Mets’ dugout and held signs offering the Mets’ catcher their hands in marriage. Fans of all ages jockeyed for the chance to call out his name as he jogged by, and cheered when he acknowledged them with a tip of the hat. In short: He was the man. The real King of Queens, Kevin James be damned.